The Bijlmer Euro is an complimentary local currency for South East of Amsterdam which creates economic benefits for local people, inspires social connections and builds a complex network identity for the Bijlmer. The model for this unique community trust system was developed by the artist Christian Nold together with the local community of Bijlmer. The project was inspired by other local currency systems of which there are tens of thousands of functioning money systems across the world, which all function to support community development and representation. Click here HERE to read more about the conceptual background of the project. 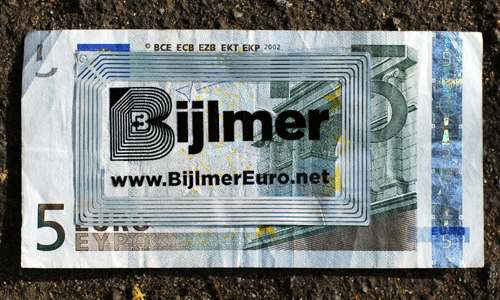 The Bijlmer Euro is a standard Euro banknote, which has a special Bijlmer Euro sticker attached to its surface. The stickers contain a unique electronic RFID-tag that communicates with the technical system created by Christian Nold for each of the participating shops. When scanned by a reader in one of the participating shops, the RFID-tag responds with a signal to identify that this unique note has been used at that time in this shop. Using the special sticker on the Bijlmer Euro, one can trace the route that the money is travelling through the Bijlmer from shop to shop. These movements are translated into a real-time visualisation that can be found at www.graph.bijlmereuro.net. The numbers next to the shop names shows the number of notes that have been used at that shop. How can I get a Bijlmer Euro? Just bring your own Euro notes to our Mobile Bicycle Bank which will be touring the Bijlmer, and we will ‘convert’ them for you, by placing a Bijlmer Euro sticker onto your money. The Mobile Bank is located at the Imagine IC office close to Bijlmer Station, and will also be traveling through Amsterdam Zuidoost during the project! For dates and locations check here You can even make your own money if you follow the instructions here. The conversion process is free and painless. Its just a sticker attached to your money! If you want, you can even remove it from your note and attach it to another note, without destroying or affecting the original euro banknote. Bijlmer Euros can be used in any of the participating Bijlmer shops. All the shops offer unique discounts when using the Bijlmer Euro rather than normal money! The discounts are listed on this website and also available on the printed maps distributed around the Bijlmer. Why not go a bike tour of the Bijlmer and visit them all? The selected shops have been chosen because they give a strong representation of the Bijlmer economic network, often offering unique goods that cannot be bought at other places and because they form hubs where different local communities meet. Go here to read more about the participating shops. What’s in it for me? Discounts! 1 As a consumer you will receive unique discounts which you would not be able to get otherwise. 2 It offers a great opportunity to explore new local shops and to contribute to the sustainability of the local economy! By using the Bijlmer Euro you are helping local shops which create the social fabric of a place and which are more responsive to the local community than large corporations. Via this project you are keeping money flowing through the Bijlmer rather than disappearing to multi-national chain-stores. 3 Finally you can follow your money online via the visualisation and see the level of social connectedness of the Bijlmer.